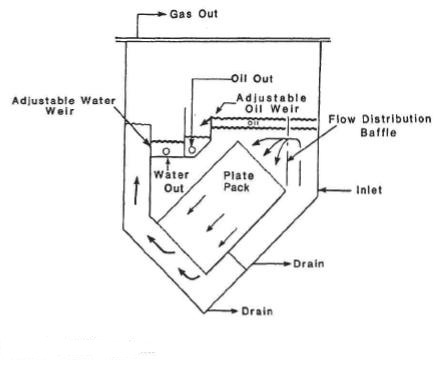 API and CPI (Corrugated Plate Interceptor) separators are predominantly used in separation of free oil from produced or effluent water or suspended solids for oily water treatment in an (Oily Water System) (OWS).The basic principle of difference in gravity between the phases (liquid – liquid or solid – liquid) is employed in an OWS in separation of the two phases. This phenomenon is defined as “Gravity Separation”.It is clear that the phase with high density will settle and with lower density will float to the surface of fluid. In an OWS, the effectiveness of this technique is subjected to various factors such as density difference, viscosity of the oil, factors of the medium, temperature, turbulence, and also the nature of impurity etc.In some cases chemical coagulation and flocculation is needed for removal of the impurities by making them heavier. In separation technique while considering the above referred factors, which affects the separation of impurities, an overflow rate (m3/m2/day) or settling velocity (m/hr) is arrived at. This factor determines the surface area required for the gravity separation in an OWS. Incidentally it also underlines the point that gravity separation is independent of the depth of basin. But while saying so, one must keep in mind that quiescent conditions are required for good settling.In Oily water treatment, tilted (placed in predetermined angles) plate packs are used in CPI/ TPI separators to improve the size and economy of the separator system. As corrugated plate packs are predominantly used, the tilted plate pack type separators are widely known as Corrugated plate interceptor or simply as CPI separators. However, a TPI (Tilted plate interceptor) may use a corrugated type plate pack or simply plain parallel plate pack. Hence, TPI separator is a generic terminology used in such type of separators.The separator when used in separation of liquid – liquid phases (predominantly removal of free oil in oily water treatment) are called a TPI (Tilted plate interceptor) or a CPI separator. Any separation of suspended solids in oily water treatment by use of CPI (Corrugated plate interceptor)/ TPI (Tilted plate interceptor) separator is incidental due to difference in gravity between the effluent’s liquid phase and the solid phase. The corrugated plate pack in a TPI/ CPI separator, used in Oily water treatment for removal of free oil, consists of number of parallel corrugated plates. A Plate pack is a housing of flat plastic plates (strengthened by resins) and stiffened by a frame made from plastic material (strengthened by resins) and/or stainless steel. The number of plates in a Plate pack is determined by various calculations as well as based on experience on various effluents and applications. The number of plates per Plate pack is also factored to a certain extent on economy of size of the separator. The number of Plate packs per TPI/ CPI separator is calculated based on the effluent flow and its characteristics to the unit. The liquid to be treated flows through the spaces between the Corrugated Plates in each Plate pack. Ideal condition for separation is achieved in the TPI (Tilted plate interceptor)/ CPI (Corrugated plate interceptor) separator by simulating a laminar flow condition through the plate pack. In order to reduce the frictional resistance between the separated material and the corrugated plates to a minimum, particular attention needs to be paid to the smoothness and hardness of the plate surface. The Corrugated Plates as well as the casing of the Plate Pack of TPI/ CPI separator are generally made from glass fiber reinforced polyester resin. This material is resistant to the most frequently used chemical additives and temperature as well as effluents to be treated. – Very low maintenance cost since there are no moving parts. – High efficiency and capacity combined with compact volume. – Can handle shock loads of flow without affecting effluent quality significantly. – Selection can be done from large number of type of basins (RCC, Mild Steel, Stainless Steel) for plate packs in TPI/CPI separators. A schematic of CPI separator is depicted below. – Ineffective with small oil droplets or emulsified oil, Require long retention time to achieve efficient separation.